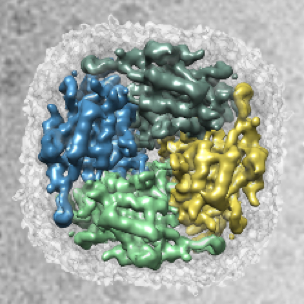 Our research in the Laboratory of Structural Biology (LSB) at the Helsinki Institute of Life Science (HiLIFE) is aimed at understanding the structure and function of biological macromolecules and their complexes, such as molecular machines and viruses. We strive to decipher possible common principles in their assembly and evolution. Detailed mechanistic understanding of structures involved in disease is informing rational design of therapies. We apply a broad range of molecular biology and bio-imaging methods in our research. Our core skills centre around cryogenic transmission electron microscopy (cryo-EM), a method suitable for structural studies of small proteins, large complexes, viruses, and even organelles or sections of cells. We are active in computational method development for processing data from such targets. Our research is funded by the European Research Council under the European Union’s Horizon 2020 research and innovation programme (PI's ERC Consolidator grant) and HiLIFE.